Baltimore Washington Eye Center participates with most major insurance companies. Please feel free to review that insurance list. Insurance Plans (download pdf) However, it is very important that you understand your specific insurance policy and adhere to any requirements such as obtaining a referral prior to your appointment. Please call your insurance company for any questions about your policy. Cancellations: Should you need to reschedule your appointment, we would ask for 24 hours notice. There are a number of types of corneal dystrophy with some being quite rare and others being somewhat frequently seen and diagnosed by the eye doctors at Baltimore Washington Eye Center. As a corneal specialist, I can provide consultation and diagnosis for corneal dystrophies such as Fuchs’ Dystrophy, Map-Dot-Fingerprint Dystrophy, Lattice Dystrophy and Keratoconus, and, where indicated, can help patients with treatment options and recommendations to help preserve their vision. Fuchs’ Dystrophy is a slowly progressive disease of the cornea that can develop in both eyes and is slightly more common in women than men. While it is possible to observe Fuchs’ Dystrophy in people in their 30’s and 40’s, it usually does not compromise vision until people are in their 50’s or 60’s. The innermost layer of cells in the cornea, called the endothelium, is a single layer of non-regenerating cells. The endothelial cells are responsible for pumping water out of the cornea and helping to maintain corneal transparency. While the reason is poorly understood, in Fuchs’ Dystrophy, endothelial cells die, causing the remaining endothelium to shoulder the burden of pumping water, with reduced efficiency. This results in corneal swelling and distorting vision. In its later phases, Fuchs’ Dystrophy is often associated with considerable pain as the epithelium “blisters” by forming “bullae”, which begin to burst. Early in the course of Fuchs’ Dystrophy patients will wake up with blurry vision that gets progressively clearer as the day passes. This phenomenon occurs because the cornea normally takes on water and swells during sleep. A healthy endothelial pump is necessary in order to restore the cornea to a normal thickness. 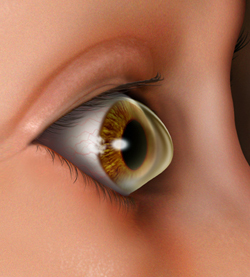 In Fuchs’ Dystrophy, the endothelium removes fluid from the cornea less efficiently. As the Fuchs’ Dystrophy disease worsens and the vision begins not to clear, we will attempt to help reduce the corneal swelling each day with eye drops and ointments. However, when these measures fail to provide comfort and clear vision, it may be necessary to have some type of corneal transplant. One of the more popular treatment options is a type of transplant procedure called DSEK (Descemet’s Stripping Endothelial Keratoplasty) where it is possible to transplant endothelial cells, which may help certain Fuchs’ Dystrophy patients overcome their discomfort and vision problem. The outermost layer of the cornea, called the epithelium, is attached or anchored to an underlying basement membrane, called Bowman’s Membrane, in order to remain healthy. Sometimes the epithelial basement membrane develops abnormally making it difficult or impossible for the epithelium to adhere properly to the basement membrane. If the epithelium does not adhere properly, Recurrent Corneal Erosions will occur. Recurrent Corneal Erosions are painful and cause the corneal surface to become irregular resulting in intermittent blurry vision along with the discomfort and foreign body sensation. Map-Dot-Fingerprint Dystrophy is also known as Epithelial Basement Membrane Dystrophy because it is caused by a lack of the healthy formation of the Basement Membrane. It affects adults between the ages of 40-70 and can sometimes begin earlier. As the name implies, its appearance is of a map of gray areas, which may also be accompanied by opaque dots, and fingerprint-like whirls or lines. We often detect Map-Dot-Fingerprint Dystrophy during a routine eye examination in patients who are asymptomatic. If treatment is required to control the pain for those patients who are symptomatic, we may prescribe lubricating eye drops, patch the eye, apply a soft bandage contact lens, oral medication, or in more severe cases, scrape the cornea to attempt to achieve better adhesion of the epithelium. In some cases, we might suggest that the best results can be achieved using Excimer Laser Phototherapeutic Keratectomy (PTK) to smooth the surface of the cornea. Lattice Dystrophy occurs as a result of the accumulation of abnormal protein fibers, or amyloid deposits, in the middle cornea layer called the corneal stroma. If these deposits become dense enough they will become opaque and affect the corneal transparency so that vision is reduced. If these deposits occur under the outermost layer, the epithelium, they can cause recurrent erosions of the cornea, which can be painful and disturb the normal corneal curvature, effecting vision. In instances where there are recurrent corneal erosions and pain, it might be necessary to prescribe eye drops, ointments and occasionally an eye patch or bandage soft contact lens. Early Lattice Dystrophy seems to respond well to Excimer Laser Phototherapeutic Keratectomy (PTK) whereas more serious cases may require a corneal transplant. Keratoconus is disorder of the cornea characterized by a progressive thinning of the tissue, and instability of the cornea. The cornea begins to bulge outward and become cone like. It is the most common corneal dystrophy found in the in the United States. As the cornea begins to bulge, it causes considerable changes in the refractive power of the eye producing nearsightedness and astigmatism. Keratoconus usually affects both eyes. At first it may be possible to correct your vision with contact lenses. Unfortunately, for about 20% of patients, contact lens intolerance develops making a corneal transplant necessary. If you require a corneal transplant for keratoconus, we will take all the time necessary to explain the risks, benefits and likelihood of success in your particular situation. Please be assured that all of your questions will be answered so that you can make an educated and informed decision about your treatment options at Baltimore Washington Eye Center. If you, a family member, or someone you know is concerned about a family history or other risk factors for corneal dystrophies such as Fuchs Dystrophy, Map-Dot-Fingerprint Dystrophy, Lattice Dystrophy and Keratoconus or needs an appointment, please call Baltimore Washington Eye Center at 800-495-3937 to schedule an appointment. About Fuchs Corneal Dystrophy, Keratoconus, Lattice & Fingerprint Dystrophies at Baltimore Washington Eye Center in Glen Burnie and Gambrills Maryland. Baltimore Washington Eye Center provides quality ophthalmology services including laser assisted eye surgery such as LASIK, laser cataract surgery, advanced technology lens implants (IOL), diagnosis and treatment of glaucoma, macular degeneration, diabetic retinopathy & dry eye, as well as eye exams for cataracts, eyeglasses and contact lenses.